Team Traction Control have come away from Brands Hatch with a growing sense of confidence for the future and pride in the young rider they have aboard the new Yamaha R6. Going into round 5 of the British SuperSport Championship, TTC were feeling the pressure. 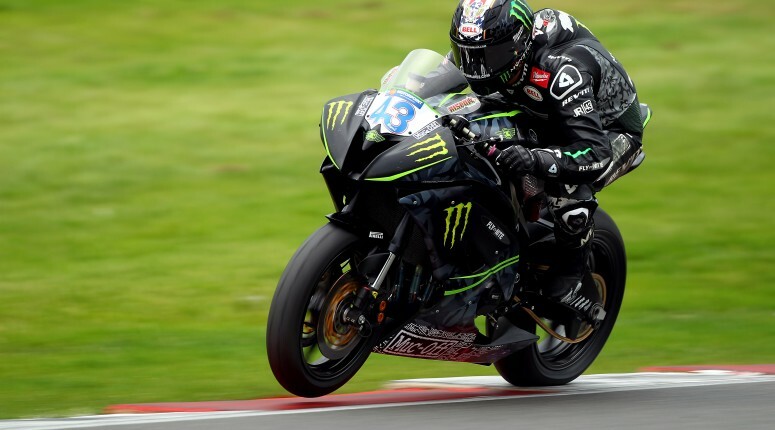 The decision to change bikes midway through the season was not taken lightly but Team Principal Paul Bolwell and owner Keith Flint are determined for James Rispoli to have the opportunity to battle for top race results. The weight of that decision placed equal pressure on the young American to perform for his team as much as on Bolwell and Flint in making it. From free practice onwards that big decision to change bikes was already paying off, thanks to the skill of Rispoli. As team owner Keith Flint arrived from performing in Switzerland with his band the Prodigy – making the time to be with his team between huge European gigs – the expectation of a big performance was high. Sadly, disaster struck in the very early stages of qualification. James began really well in the damp and tricky conditions and was sitting in 2nd place when he had a huge high-sider at Paddock Hill and badly damaged his ankle. Prior to that, his lap times had been right on pace. This piece of bad luck could have been the end of the weekend and a huge disappointment, however what followed was proof that Rispoli is deserving of Keith’s and Paul’s belief in him, and a demonstration of how committed this talented rider is to making an impression at BSB with Team Traction Control. After a visit to the medical centre with his rock legend boss looking on, James started Saturday’s sprint race in 16th position on the grid, having missed most of qualification. The race started and immediately Rispoli was battling and in a race of just 12 laps he moved through the field to eventually finish 8th. The crash meant Sunday was always going to be very difficult: the damage to James’ ankle was causing a lot of swelling and he struggled with changing direction on the bike. Even a blinding start couldn’t help: whilst riding hard in the front pack James ran wide, lost seconds that became incredibly hard to make-up and ended finishing in 12th place. Not the result that the potential has shown, but the manner in which it was done showed a determination and potential in this team that is very exciting.